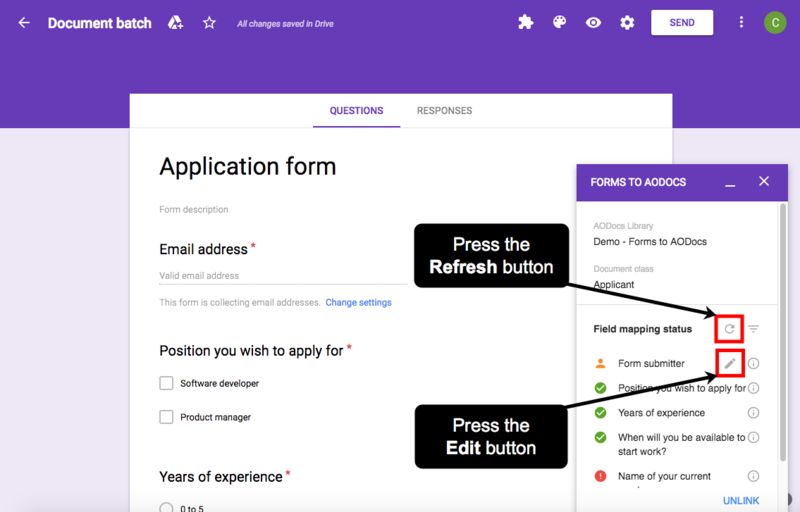 Forms to AODocs is an add-on for Google Forms. It allows users to create content quickly in AODocs. It's as easy as filling out a Google Form and submitting it. The Forms to AODocs add-on creates a bridge between a Google form and an AODocs library. Users answer questions on the Google form that match the AODocs document properties. Files uploaded through the form will become attachments of the AODocs document. This article explains how to configure Forms to AODocs. Your Google form must follow some design guidelines to be linked to an AODocs library. The title of a question must be the same as the name of the corresponding AODocs property. The question type you select should ‘naturally’ match the type of AODocs property field it is supposed to feed. For example, when you set up a question that feeds a Date property field in AODocs, use a “Date” question type, not a “Short answer”. - If your library contains mandatory properties but your Google form doesn't have corresponding questions, the AODocs document is created without a value in the mandatory property. - If your library contains properties with multiple values, Forms to AODocs will not support them. Learn more: Forms to AODocs: Known limitations. 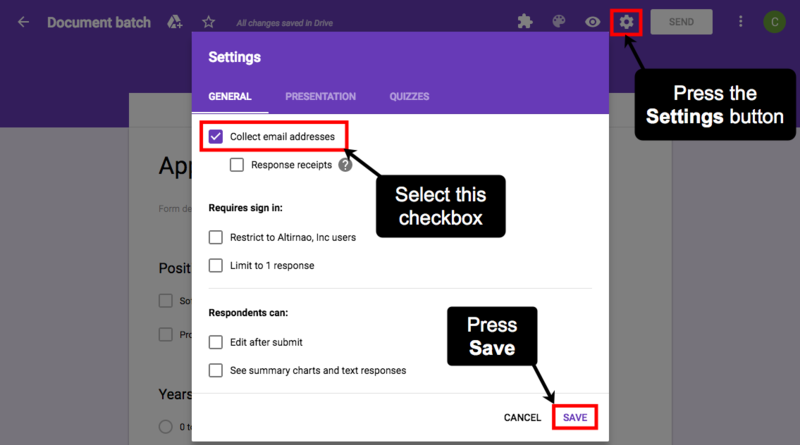 Google Forms provides file upload support for G Suite customers in Google Forms. Forms to AODocs takes full advantage of this feature, even when multiple files are supplied by the end-user. - Google automatically restricts a form with file upload to the users of your domain. Form respondents therefore have to be authenticated with a G Suite account of the domain to fill in the form. - As owner of the Google form, if you enable file upload on your form, make sure you have sufficient Google Drive storage, as files uploaded by form respondents will consume your storage quota before being owned by the library storage account. If the limit of your storage is reached, the form will be blocked until some storage is freed. In Document Management libraries: one document is created in AODocs and all the uploaded files are attached to it. In Team Folder and Secured Folder libraries: one document is created per file uploaded. Document properties gathered from form answers are duplicated across all the documents created. Important: When you link a form to a Team Folder or Secured Folder library, you must add a mandatory file upload field in your form. If the end user doesn't upload a file, the import of the response in AODocs fails. Important: Forms to AODocs imports user responses in best effort. If a user’s answer doesn’t match any AODocs properties (because none has the same name as the question or the question and field types are not compatible), this answer is added to the description field, alongside its question title. If you have exactly the same number of Google form questions and AODocs properties with the same title and the same type, all your fields should match. If you have fewer questions than you have properties, the unmatched properties will be empty when the document is created, even if the field is mandatory. If you have more questions than you have properties, the unmatched questions will be filled under the description of the document with the indication “Non recognized form answers:”. Note: The author of the documents created through the add-on will always be the account of the library administrator who configured the add-on. 1. Press the Add-ons button and select Forms to AODocs. 2. Select Get started in the pop-up. 2. Wait for the sidebar to be displayed, then select the library you want the Google form answers to be imported to. Note: You can only select libraries where you have administrator rights. 3. 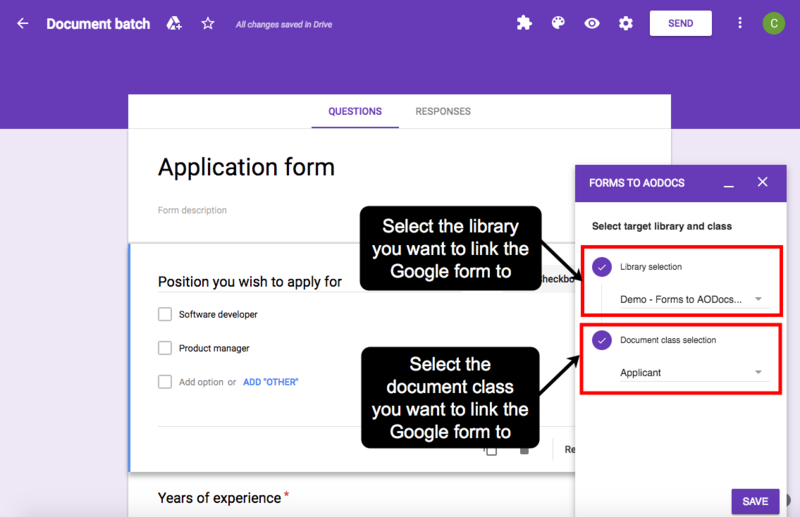 Select the document class you want the documents created by the Google form to belong to. 5. 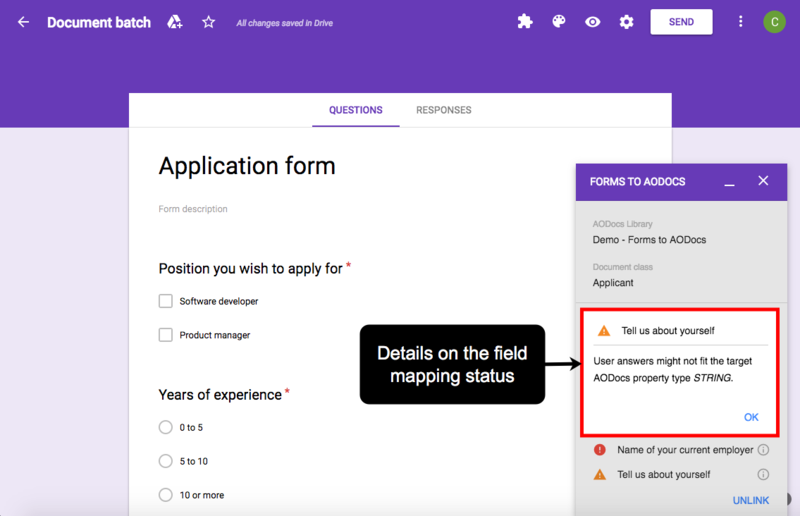 The Forms to AODocs connector tries to match the properties of your document class with the title of the questions of your Google form. 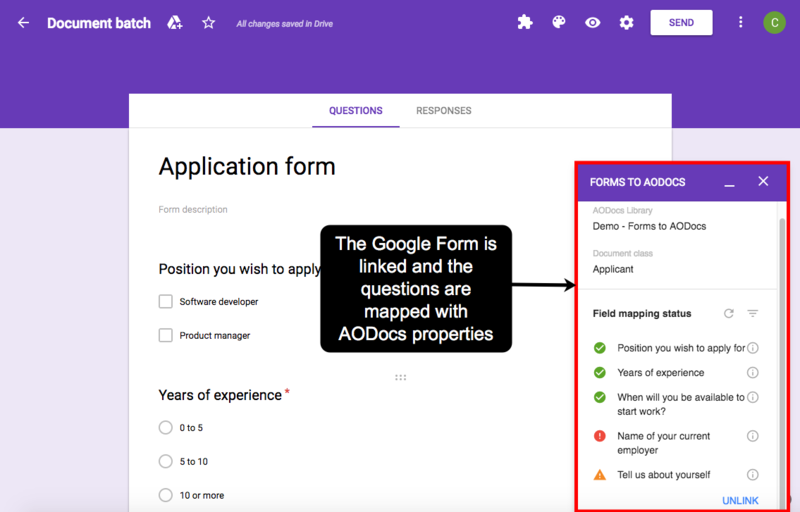 You can preview the mapping of the Google form questions to the AODOcs properties. 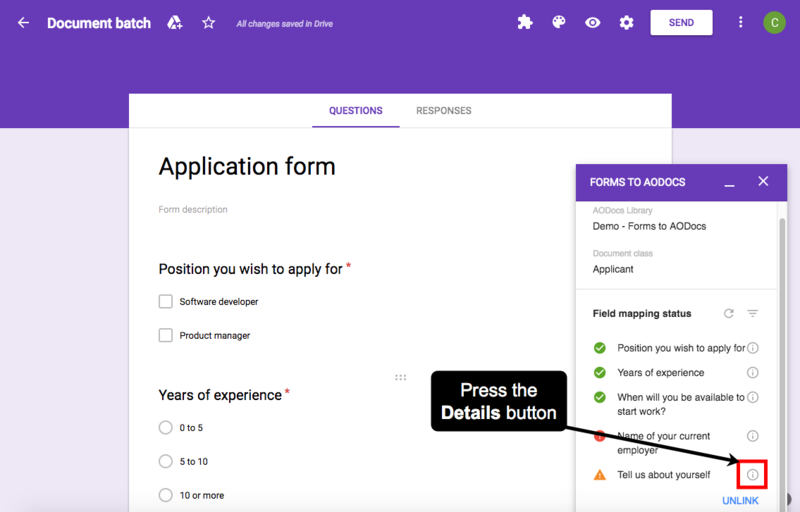 Now every time a user of this form hits the Submit button, their answers will be imported into the selected library and document class in AODocs. The Forms to AODocs sidebar displays an overview of the mappings between your form questions and the properties of the AODocs document class you bound to the form. Success indicates that your question is correctly configured with respect to the AODocs property and that user answers to it will be imported correctly. Warning indicates there is a risk that answers to your question may not be imported correctly in the corresponding AODocs metadata, depending on the user's answer. Failure indicates that answers to your question won’t be imported to an AODocs metadata. User answers to such questions will be listed in the document’s Description property. 1. Press the Details button next to it. 2. View the detailed message and press OK to close it. Learn how to filter your mappings. 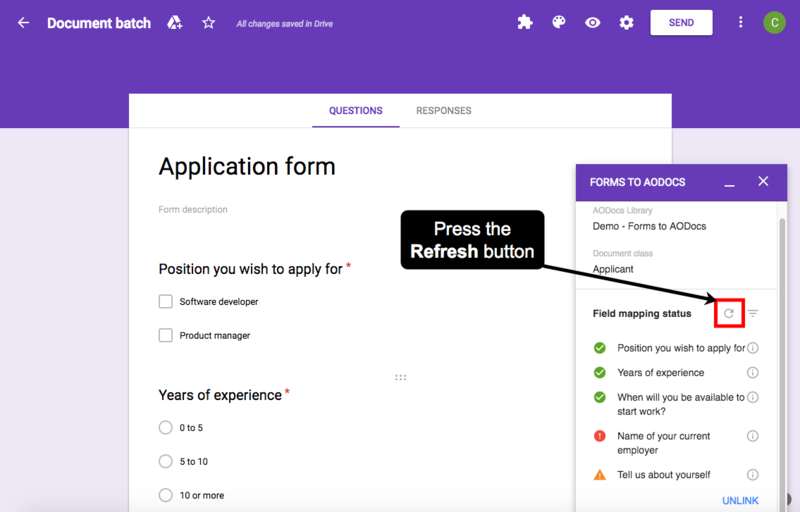 When you make changes to your Google Form or to your document class properties, press the Refresh button in the sidebar to update the field mappings. You can identify the end-users of your form by collecting their email addresses. You can also save these addresses to a document property. 1. Press the Settings button in the top right of the screen. 2. Select the Collect email addresses checkbox. 4. In the Forms to AODocs sidebar, press the Refresh button. A new item, Form submitter, is displayed. 5. Select the Edit button next to Form submitter. 6. Select the AODocs property you want the email addresses to be imported to. Only String, Person and Dynamic category properties are available for selection. Note: Make sure the field you select isn’t already matched with one of your form questions. If you set up two mappings to the same AODocs property (one from a question on the form and another by collecting end-user email addresses) the AODocs property will be populated with data from the question on the form. 7. 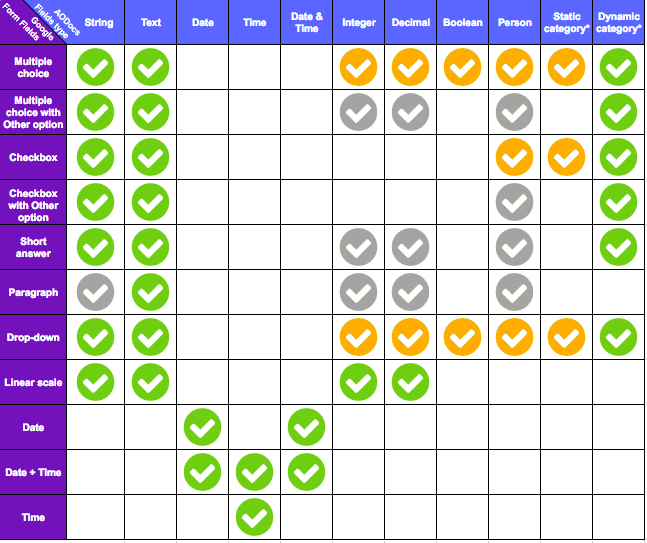 Press Save to validate the mapping. When a user submits a form, their email address will be imported to the selected property. 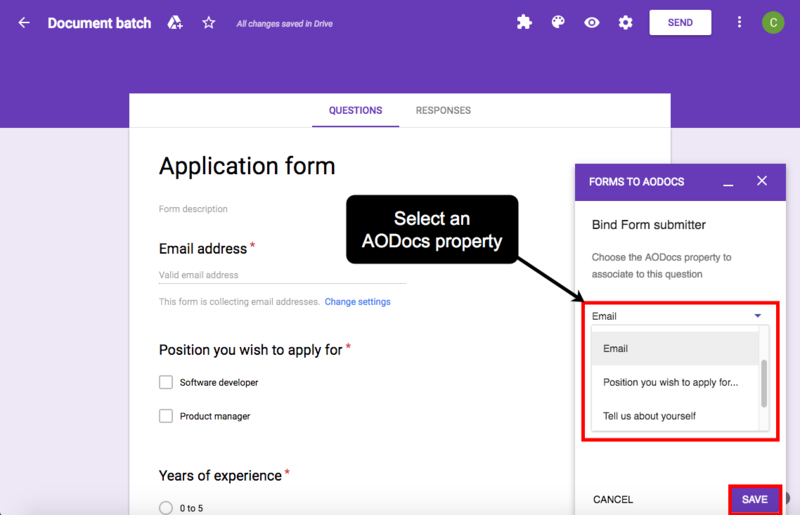 Note: If you activate the Collect email addresses option in Google Forms but don’t select an AODocs property to collect them, the email address of the end-user will still be displayed in the Description property of the created documents. What is the Forms to AODocs add-on?